christmas | Use. The. Clutch. It’s far enough past Halloween that I don’t feel (too) guilty for writing about Christmas. Traditionally speaking, I don’t let myself listen to Christmas music until the day after Thanksgiving. Every holiday deserves it’s own space and, for some reason, waiting until after Thanksgiving makes Christmas seem even more special to me. But this morning, I went ahead and listened to the Christmas playlist I’ve been working on for a few weeks. And I don’t feel one bit of bad about it. If someone were to ask me what my favorite kind of music is, I’d have to say Christmas music. It’s a genre. I’m deciding that. Apparently, when I was quite small, it was the only type of music that would put me to sleep. It’s no wonder it feels so relaxing and homey to me. There are few Christmas songs I don’t know all the words to. I wish I had my piano set up right now. I miss playing the piano, but I really miss playing Christmas music. I’ve been thinking a lot about things I want to accomplish in my personal life. I always said I wanted to write for Vanity Fair, but those odds are so very slim. Singing is the only thing in my life other than writing that has so completely consumed me. But I don’t really play any instrument well and I’m a pretty terrbile songwriter, so I usually just end up singing karaoke whenever I get the chance. I’ve been able to sing BGVs on a number of albums thanks to a producer I know in Denver. And my best friend in the whole wide world is a real live rock star and let me sing a BGV or two at her first show in Nashville. But I’ve never even considered the idea of doing my own thing. Until a couple weeks ago. I was driving home form Richmond and turned on some Christmas music (hey, it was cold and foggy and looked like it could snow and I had a hot cup of coffee in the car. The elements were almost entirely there). I decided that I’d give myself the chance to record a Christmas album for my 40th birthday. It’s a few years off, which is good, because our family is about to move literally to the other side of the world for a few years and (shockingly) recording music costs money that I need to work for and save up. But I’m going to do it. I have a few things in mind, but I have no idea what it’s going to cost, how to go about asking people to help me, or even how to arrange a song (not to mention get the rights to). I literally have zero marketable skills when it comes to music. I can read music and find a harmony more quickly than most people I know and I can hold a hell of a tune. But I’m no musician. Despite all of that, this is something I’m determined to do. I want something tangible that I can give to my daughters some day, something that is real and meaningful and completely me. Because if there’s one thing they’re going to know about me, it’s that I’m basically a lunatic elf hopped up on peppermint when it comes to Christmas. And so begins the holiday season! 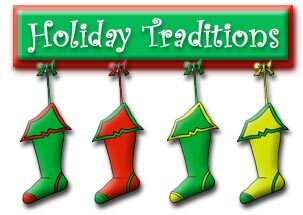 This time every year, I start thinking about all the traditions my family has that have been around for as long as I can remember. There’s the “creepy Santa” and the Christmas Adam party, we always make way too many cookies (which allows us to gorge well in to January), listening to The Beach Boys while decorating the tree seems perfectly normal, my dad’s turkey gravy which is undoubtedly the most delicious gravy you’ll ever eat, watching the Macy’s Thanksgiving Parade followed by the dog show followed by football. There are a million amazing things we do every year. That’s right. I said it. I love the family fight that ensues every single year on Christmas Eve. And it’s all about soup. My dad makes this amazing spicy creamy potato soup with bell peppers (and, more recently, andouille sausage, which I don’t enjoy, but can pick around). We have always – ALWAYS – had this soup for dinner on Christmas Eve. We have soup, crackers, and cheese, then we watch A Muppet Christmas Carol (skipping that awful song that young Scrooge’s girlfriend sings), and make our way to our church’s Christmas Eve service. It’s been this way since at least 1996. My mom and I have facts and sources to back up this claim. Yet every year, my dad swears that he makes potato soup for lunch on Christmas Day. Dad: Okay, so what time do we want lunch on Christmas? Soup sound good? Me: Seriously, Dad. Every year? It’s always for dinner on Christmas Eve. Mom: Why in the WORLD would we eat lunch on Christmas Day? We have a huge breakfast, snack all day, then have a hug dinner followed by the richest dessert. Soup is on Christmas Eve! The fight has become something of a joke for our family now (although I suspect my dad will one day enforce the Christmas Day soup). But I don’t imagine we’ll ever go an entire holiday season without having that fight.